In my experience, there are two possible outcomes to a test ride. One is that I fall hopelessly in love, and can think of nothing else but how wonderful the bike is and what a difference it will make to my life – with the inevitable consequence that I cannot rest until I’ve bought it. The other is that a bike I’ve spent days drooling over turns out to be rather more prosaic than I’d been imagining, and my dreams are left in tatters. On the one hand lies penury and on the other, disillusionment. Neither outcome is particularly desirable, which is why I don’t take many bikes out for test rides. But this time was different. This time I had a reason for taking a bike out for a test ride. It didn’t matter if I fell in love – in fact, that was the whole point of the exercise. The plan was to try out a few different bikes – after all, if the Cityglide turned out not to be the bike of my dreams, I needed a plan B. Unfortunately, the weather had other ideas. The day of my test ride dawned soggily, and got progressively wetter as the hours passed. By mid-afternoon, when I’d finally talked myself into going out, the rain had settled into a steady, unrelenting downpour. Consequently I only managed to take two bikes out – the result of my own reluctance to get any wetter than was strictly necessary, combined with an unhelpful sales assistant, who seemed to be more concerned about having to clean the bikes I was taking out than with helping me to find the right one. First up was the Cityglide. As the sales assistant wheeled it out, I felt a pang of disappointment. The website had described it as ‘light brown’, but in reality it was more of a salmon pink. This wasn’t quite the beautiful bike I’d been dreaming about – it was entirely the wrong colour. Swallowing the urge to tell the sales assistant that I’d changed my mind, I told myself to stop being so superficial. The least I could do was try it out. After all, if it turned out to ride well I could always paint it a different colour. It actually rode surprisingly well, once I’d got used to it. It’s a different shape from other bikes I’ve ridden, and the riding position is much more upright. It was a little unnerving at first, and I wobbled rather alarmingly until I was able to settle into the position. I also had a few difficulties with the gear shifters; instead of the gear levers I’m familiar with, the Cityglide has a twist shifter. I kept twisting it the wrong way – going up a gear rather than down – or completely forgetting that was how I changed gear. These were all problems I knew time would fix, so I took the Cityglide for as long a ride as I dared, in the hope I would have started to adjust to it before I had to take it back. It’s a much lighter bike than I’d expected and that, combined with the range of gears, meant I was able to get up to a reasonable speed on it. 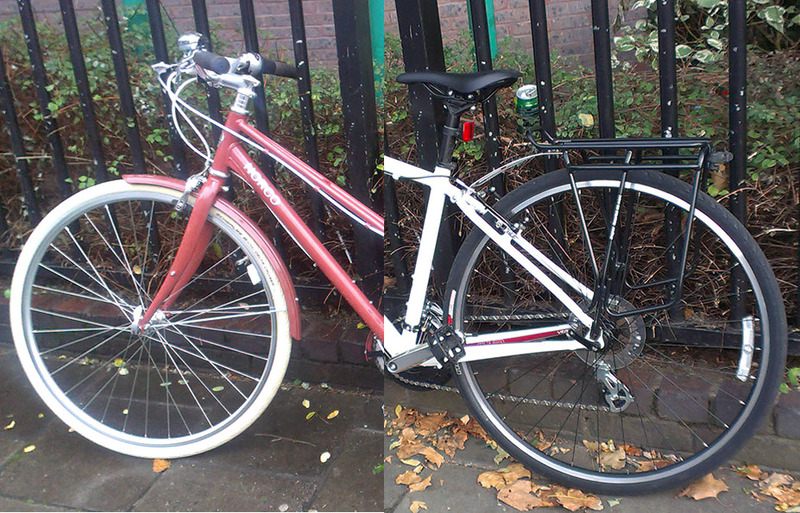 I even took it up Haverstock Hill to see how it handled hills – both going up and down – before returning it to the shop. The next bike I tried out was a Specialized Vita. I’ve had three Specialized bikes now, so I wasn’t expecting any surprises with this one. There weren’t any – it was like riding the Trusty Steed, but with smoother gear changes and tighter brakes. So which did I go for? The familiar and predictable Specialized, or the exotic and beautiful – albeit pink – Cityglide? Whichever bike I chose would have to be my only bike – my go-anywhere, all-seasons, carry-everything bike. I don’t have enough space in my flat for more than one bike (unless I can get a key to the bike shed). When I thought about it like that, the decision was simple. As lovely as the Cityglide was, I couldn’t see it being anything more than an occasional bike. I couldn’t see myself riding it to work and back, every day, in all weathers, nor could I see myself going for a long ride out into the countryside on it. So I chose the Specialized. I’ve only had her for a little over a week, but already I know it was the right choice. She even has a name – Eva. As for the Trusty Steed, I couldn’t face the thought of abandoning him after his years of loyal service. I figured no one would want to buy such an old and knackered bike, so I’m putting him out to pasture instead. He’ll spend his retirement at my parents’ house up in Sheffield, where I’ll be able to visit him and take him out for occasional rides. Great choice. I bought my wife (reluctant cyclist) a vita last year. She now loves it and scowls when I go cycling without her. She road it Newcastle-Edinburgh this summer. And it’s called Lovely. (Girls, pah!) May you and Eva have many happy miles together. And if you can face the 30 minutes from Kings Cross, we’ll gladly show you some lovely quiet country lanes up here in Leafy Welwyn! p.s. I might just take you up on that offer – as long as there aren’t any dual carriageways involved. You’d be most welcome. No dual carriage ways. Possibly dual pubs or tea shops. Lindsay (my far better half) and you are in similar lines of work so you would get on well. You can talk about misplaced apostrophes whilst I fetch the drinks! Lovely bike, so glad you found “the one”. I must admit to being bemused by the trusty steed needing retirement. I have a 22 year old Raleigh Amazon which I commute on every day (10 miles there and 10 miles back). It’s been with me through sun, rain, hail and snow; we’ve ridden across England on the Coast to Coast route, miles of off-road tracks through the forests in Suffolk and, now, it gets used as a city bike taking me too and from work. It’s panniers are frequently overloaded with clothes for the day, my laptop and groceries. I have recently treated it to a new back wheel (quick release rather than the standard one it was fitted with), mudguards and a pannier rack. It now looks as shiny and new as it ever did. It will be a sad day if it ever needs retirement. Thank you. 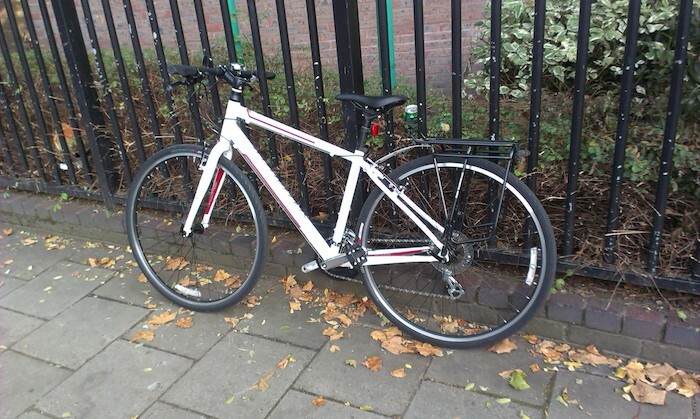 TBH, the main reason why the trusty steed has been retired is because I wanted a new bike. Because my flat is only small, I can only have one bike – so the only way to satisfy my itch for a new bike was to retire the old one. I was told by a mechanic that once a bike gets past five years, you should think about replacing it, and since then I’ve been slightly paranoid that some part of the trusty steed would irreparably break. My money was on it being one of the seat stays, as my pannier bag was banging against it and wearing it down. I had visions of it snapping mid-ride, with dire consequences. 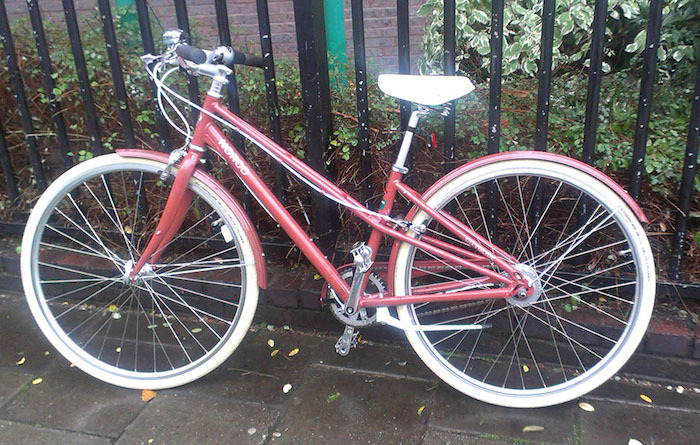 Wanting a new bike – yay! Ah so that was the outcome and I quite understand that UK flats may not have as much space as Aus ones, but how nice is it that the Trusty Steed can be retired and have the occasional outing. Specialized are a good brand. This is the fourth Specialized I’ve had – the first two got stolen, and the trusty steed was the third. I hope Eva lasts as long as him, and doesn’t go the way of the first two. keeping those white tyres the same colour as when they came out of the shop would have been a full time job on it’s own! I know! The effort of keeping a pretty bike still looking pretty was another deciding factor. I don’t clean my bike half as much as I should! Congratulations on your new addition! Hard to go wrong with Specialized and I’ve heard great things about the Vita. Was a bit bemused though that the need for a new cassette and chain was the final nail in the coffin for the Trusty Steed… those are consumables, to be classified under “maintenance” not “repair”, surely? Though £60 is a cough-inducing quote from your bike shop for supplying and fitting them – the parts come to about £25, £30 max, so 50+% for labour?! Yep – it was a £30 labour charge on top of the parts. There were two reasons why it was the final nail in the coffin. The first was that I could guarantee those wouldn’t be the only parts that needed replacing, and the price would skyrocket. The second was that I told myself that, with all the money I’d spent over the past few months buying new parts for the trusty steed, I could’ve bought 2/3 of a new bike. If that makes sense! I was already seriously thinking about getting a new bike, and this just seemed like the final push that tipped me over. You’ll all be relieved to know that The Trusty Steed has started a well earned retirement in Yorkshire, and appears to be enjoying it….